DX Extra Shortwave News No.20 Released! So you came for the Pirate Station Special? Click here. Hello fellow DXers, it is with great excitement to release the latest shortwave news programme DX Extra number 20 to the world wide web! Another jam packed show! “Snowfall that started early this morning in the Mid-Atlantic States was just the first hint of what weather forecasters are calling a potentially historic and dangerous winter storm that is predicted to affect the entire Eastern Seaboard of the US. In addition, the gathering storm carries the threat of high winds, blowing and drifting snow, “whiteout conditions,” and possible — perhaps likely — power outages. A state of emergency has been declared in New York, New Jersey, Connecticut, and Massachusetts, and Connecticut Gov Dan Malloy ordered a statewide travel ban effective at 9 PM on Monday, January 26. Eastern Pennsylvania Section Manager Joe Ames, W3JY, reported that the Eastern Pennsylvania Phone and Traffic Net has been put on standby/watch mode on 3917 kHz. “We anticipate no particular activation in Eastern Pennsylvania,” he said, “but if it’s as bad as predicted, we’ll assist however we can.” Snow has already begun falling in Eastern Pennsylvania. Doane said the Connecticut Digital Mobile Radio network was up and running, with ARES officials monitoring, and the state EOC is tied in with the Connecticut ARES network. In Maine, store traffic has been brisk in coastal areas as residents stock up on necessary food, fuel, and supplies as well as generators, additional batteries, and auxiliary heaters, in case of a power outage. Maine SEC Phil Duggan, N1EP, has placed Maine ARES on a Yellow Alert (Level 1), due to the approaching storm, which is forecast to reach the state sometime after midnight. In a Yellow Alert, ARES/RACES members are advised that they may be called up and should monitor available ARES nets and public safety radios as well as weather radios and broadcast radio and TV to stay current with the situation. Duggan said the NWS office in Caribou — in Maine’s northernmost tier — has requested that he call up some Maine ARES weather and SKYWARN nets on 75 meters to collect ground-level weather information during and after the storm for relay to the NWS offices in Caribou and Gray, Maine. The approaching storm has caused airlines to cancel some 5000 flights so far. Schools have called for early dismissal in parts of New Jersey. New York anticipated closing the New York Thruway and the Long Island Expressway. The entire New York City subway system may be shut down by this evening." “Along with plans for new management and to shed a third of the staff of Vanuatu's national broadcaster, the government is also looking to modernise the Vanuatu Broadcasting and Television Corporation. Despite millions of dollars of aid poured into the VBTC over the years, it is unable to provide adequate radio coverage for the outer islands, and even in areas close to the main centre. By the government's own admission, the VBTC is hamstrung, and has not been able to move with the times, but it says it has the political will to make changes for the good. Just last week, worries were raised that some communities in Vanuatu could miss out on cyclone warnings due to transmission problems with the national broadcaster's Radio Vanuatu. Our correspondent, Hilaire Bule, says there's confirmation that Pentecost Island is not receiving transmissions from Radio Vanuatu, and people in Ambae and further North in the Banks and Torres island groups also have trouble getting the station. He says transmission problems with Radio Vanuatu have been ongoing for years, and it's not just the outer-islands that have issues. HILAIRE BULE: In the Daily Post people from Efate, they are complaining about the reception of their national radio, and it's about three kilometres from the main radio station in Port Vila. It's dangerous because Vanuatu is now entering the cyclone season and people cannot receive the warning of the possible cyclone in the villages or in the communities. In 2009, Japan, New Zealand and Australia poured millions into funding a project which allowed the VBTC to set up a new shortwave transmitter to provide a radio signal to all the Vanuatu islands. However, over the years since then, signals have failed, with some equipment now having major corrosion issues. Jean Gabriel Manguy, a private consultant who was involved in helping Radio Vanuatu improve its services back then, says it's been a pattern of millions of dollars invested into the company, going down the drain. He says that's partly due to a lack of maintenance and political interference. JEAN-GABRIEL MANGUY: There has also been mismanagement, and in spite of a very significant aid project to help them, it hasn't helped the situation. It's disappointing to see once again there hasn't been any money allocated to maintaining transmitters. In other words, people in the rural areas, in the islands and in the remote areas, are being forgotten. The government has set up a committee to review the VBTC, with plans to retire or make redundant about a third of the staff, and is looking for a new general manager to head the VBTC. The Vanuatu Media Association says the government needs to recruit the right person to steer the company forward, and it needs strong leadership from the top to bottom levels. It says it is perhaps a good idea for the government to down-size the company, however, the government restructured the VBTC in 1999, and some 16 years later, the same problems are happening again. The Public Relations Officer for the Prime Minister's Office, Kierry Manassah, says the problems with the VBTC are perennial, and are partly due to a lack of political will from the national level, political interference, and people going into the company through the wrong channels. KIERRY MANASSAH: A lot of those has caused a lot of problems for the organisation. The government still sees a lot of value in VBTC, it's like the bridge between the government and the people. And so the government still values it's contribution to the national conversations, and we still think that the government can do something about it. Kierry Manassah also chairs the task-force that is looking at how the corporation can move from analog to digital programming, and he says there's a need to look at who from VBTC needs to go in light of new technology. He says they are currently looking for partners to help with the national digitisation of TV, and will look to these partners to also address radio transmission issues. Mr Manassah says depending on expressions of interest, there's the possibility that the government will contract out the management of the digital TV broadcast service to a private company. And in terms of fixing radio transmission issues, he says the government is considering switching to FM. KIERRY MANASSAH: That's the way forward, a lot of those that are still there now are short-wave and medium wave transmitters, especially with the short-wave transmitters, those are quite old and it's very difficult to find spare parts and replacements. So a lot of those need to be overhauled. Jean Gabriel Manguy says the government's committment to do something about broadcasting is welcomed and very encouraging. However, he says while in theory FM radio is a great idea, it's not really manageable. JEAN-GABRIEL MANGUY: Instead of having one or two transmitters to manage, then you need probably 50 transmitters to manage. Not only do you have to manage them, but you have to have electricity to make them function. So there are technical issues there that limit the FM option. “Effective February 1, there are key frequency changes from Radio Australia. There will be an end of shortwave transmissions (including DRM), from the Brandon site, and a reduction in transmission hours from the Shepparton transmitter site. There are no further DRM transmissions currently planned. In combination with the end of the HF Relay services from 14 January 2015, this represents a major change in content delivery for Radio Australia, with an increasing focus on local FM re-transmission and satellite delivery of programming. The following revised broadcast schedule supersedes all previously published plans. Radio Australia will operate on three frequencies, on a 24 hour broadcast schedule. Earlier reports of broadcasting 0900-2100 UTC on 6080, and 6150 are incorrect. “Public radio is beginning to surpass public television in terms of donations, according to a report issued by the Corporation for Public Broadcasting. The number of individual donors to public television dropped from 3.9 million in 2003 to 3.03 million in 2013; at the same time, public radio donors grew from 2.52 million to 2.85 million from 2003 to 2013, according to the report. The average contribution for radio is slightly higher for radio than for TV; it was $92 per person in 2003 and grew to $137 in 2013, according to CPB. The average contribution for TV was $93 in 2003 which grew to $134 in 2013. Across the board for both radio and television, several donation categories — CPB, federal and state grants, local governments and local business — went down from 2012 to 2013, according to the findings. CPB doesn’t speculate on the reasons for the change, however RW has reported that public broadcasting has been heavily impacted by the economic downturn. Revenue from categories like state colleges and universities, foundations and subscribers offset those losses for both public radio and television. Total support for public radio in 2013 was $1.08 billion, with public TV at $1.69 billion. That’s a 0.3% change for television and a 4.8% increase for public radio, compared to the year before, according to the findings. 6300 1805 Radio Blauwe Panter. Rolling Stones "Angie," some utility QRM. SINPO 43433. Moved to 6297 at 1813. SINPO 54444. 4026 1729 Laser Hot Hits. The Kane Gang. SINPO 34333. 5815U 1735 Barracuda Radio. Lenny Kravitz. SINPO 44444. 6205 1715 Laser Hot Hits via Magic. KC & Sunshine Band, swamped at 1719 by Iran signing on. SINPO 44433. 6305 0956 Radio Merlin Int. Sixties music. SINPO 24332. 6320.5 1656 Wizard Radio. Short song, female singer. SINPO 23332.6401.5 1649 Radio Joey. "Swamp Thing." SINPO 34333. 6875 0916 Radio Europe. Chaka Khan "I Feel for You." SINPO 34333. 6940 0913 Radio Enterprise. "Addams Family." SINPO 34333. 7300 0906 U Boat 66 Radio. "Last Picture of You." SINPO 24332. 9865 1415 Radio Spaceshuttle via Revival. ID, "Telstar." //6035. SINPO 54444. 12105L 0948 Radio Barracuda. ID, soft rock. SINPO 45444. 6950 23h41 Weather Control Radio 25th January 2356 Riders on the storm, 2359 stormy monday, 022off s5 here but rather fady. By member jFarley. “The FCC has ordered an unlicensed California religious broadcaster, who sometimes broadcast on a frequency in the 40 meter phone band, to shut down his station. The FCC’s Los Angeles District Office on December 31 issued a Notice of Unlicensed Operation to Martin K. Elliott of Inyokern, California. The FCC said it issued the Notice in response to a complaint of unlicensed operation on multiple HF frequencies, including some allocated to aeronautical stations. The FCC said its agents used radio direction-finding techniques to confirm that signals on 6280 kHz and 11,595 kHz were emanating from a residence located near Inyokern, and that property records indicated that Elliott was the current owner and resident. DX Extra is being relayed via World FM 88.2FM in Tawa, near Wellington in New Zealand, Worldfm dot co dot nz and on shortwave via relay partners as well so look out for us on Focus International, Magic 6205 Europe, Pandora Radio, Premier Radio and Cupid Radio. A big thank you to all our relay partners. Your generosity means a lot! Before we go it's time to get an audio clip out of the archives. This is a shortwave recording of Radio Thailand January 23rd 2015 on 9390 at 12h30UTC. 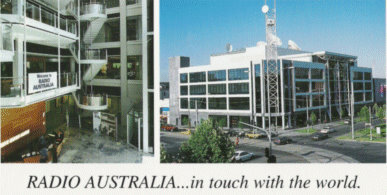 Image: Radio Australia - following more cutbacks.